Detail of late Pleistocene life in central Utah from a mural painted by Joe Venus at the College of Eastern Utah Prehistoric Museum. As highlighted in this issue of Survey Notes, Utah is an outstanding place to study the geology of the Pleistocene Epoch, the so called Ice Age. 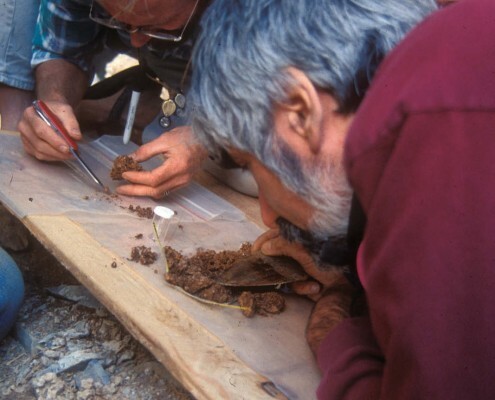 In addition to documenting the physical changes to the landscape, the geologic record also preserves evidence of Pleistocene plant and animal life. Many of Utah’s Pleistocene species still live here today, but others no longer inhabit Utah or have disappeared completely. Investigation of Utah’s Ice Age fossils provides important information on how plants and animals responded to past changes in climate. In this respect, it is not only fascinating to explore but is also pertinent to the issue of modern global climate change. By studying the effects of past climate change we can get a better idea of what changes we might expect in the future. Dramatic climate fluctuations occurred throughout the Pleistocene. Glaciers advanced during colder and wetter times and retreated during warmer and drier times, and glacial lakes including Lake Bonneville expanded and contracted. These climate fluctuations changed the distributions of plants and animals as their preferred habitats were disrupted. Similarly, the distributions of plants and animals are changing today as cold-adapted species are forced to move farther north or to higher elevations, and species better suited to warm climates take their place. If climate change and habitat disruption occur slowly, then it is more likely that plants and animals can move to more favorable habitats. If environmental change proceeds quickly, then there may not be enough time for these movements and the result may be the local, and in some cases total, extinction of species. Much of what we know about the large animals that inhabited Utah during the Ice Age comes from fossils unearthed from sediments that were deposited along the shores of Lake Bonneville. 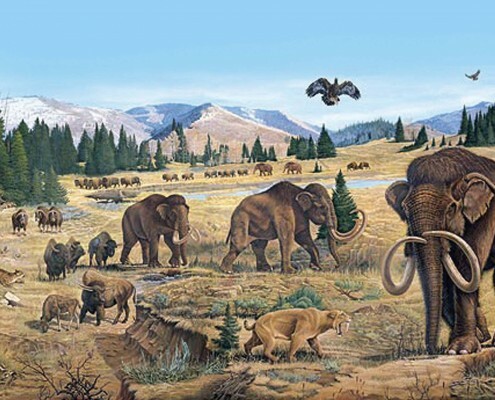 Gravel-quarrying operations along the Wasatch Front occasionally expose the bones of Pleistocene mammals such as the mammoth, musk ox, giant bison, ground sloth, and giant short-faced bear (see Survey Notes, v. 28, no. 3, May 1996). The fossils also include bones of animals such as horses and camels that went extinct in North America at the end of the Ice Age but survived in Asia. One of Utah’s most famous Pleistocene fossil discoveries was a Colombian mammoth skeleton excavated in 1988 from Huntington Canyon by former Utah State Paleontologist David Gillette. This fossil is exceptional because it is nearly complete, very well preserved, and found at a higher elevation than any other known mammoth. The skeleton is housed at the College of Eastern Utah Prehistoric Museum in Price. Casts of this specimen are on exhibit in a number of museums including the University of Utah Museum of Natural History (UMNH). Over the past 10 years several significant Ice Age fossil finds have been reported to the UGS. 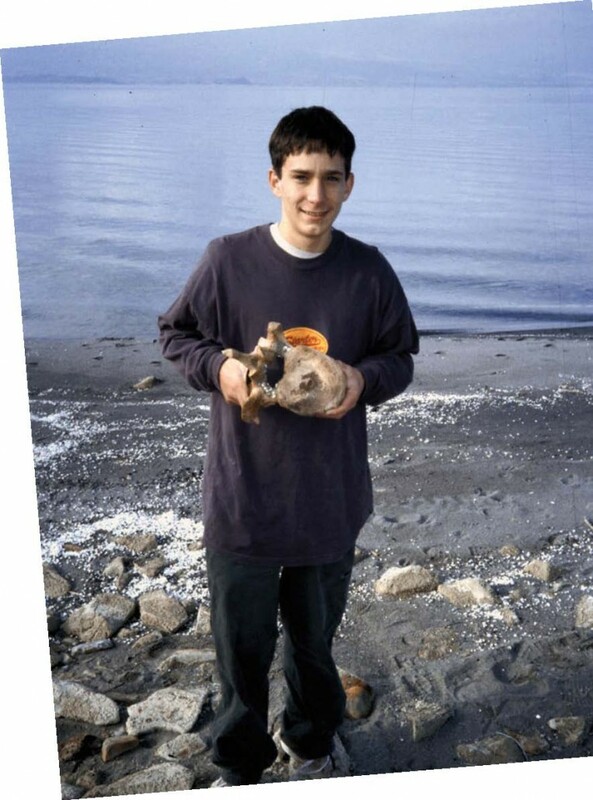 Two musk ox horns were discovered in 2001 in Lake Bonneville sediments in a Tooele neighborhood by high school student Wendy Whitehead. She donated these specimens to the UMNH. 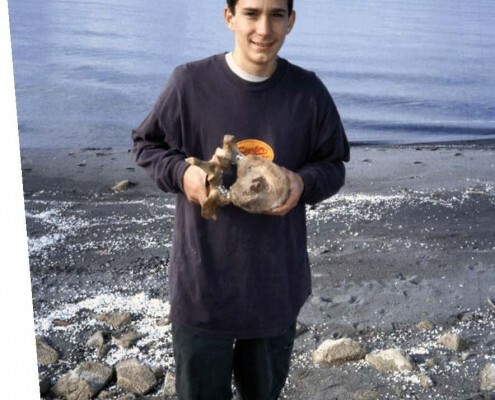 A mammoth vertebra was discovered in 2004 on the shore of Bear Lake in northern Utah by Tobin Warner while he was attending a Boy Scout camp. Like Wendy, Tobin gave his fossil to the UMNH. To thank them for donating their finds to the museum where they are available for study, I made casts of the specimens so that they could have replicas for their personal collections. Casts of these specimens are also included in our Ice Age teaching kit (see “Teachers Corner” in this issue of Survey Notes). In 2004, we received a call from Earl and Elaine Gowin who informed us that a mammoth tusk was found during gravel quarrying on their ranch near Fillmore. We excavated the tusk and brought it back to our lab in Salt Lake City to be cleaned and stabilized. The Gowins also donated their fossil, and the tusk is now on public display at the Fillmore Library. Large animals like the Columbian mammoth excite the imagination, but the small animals provide a great deal of information about climate and the environment because we know more about the habitat preferences of the small, still extant species. Most of what we know about Utah’s smaller Ice Age animals comes from just a handful of sites. Several of these are caves located in Utah’s west desert, such as Crystal Ball Cave in Millard County and Homestead Cave in Box Elder County. The bones of tens of thousands of animals, including small mammals, birds, and fish, have been recovered from these caves. Most of the bones are thought to have been brought to the caves by birds of prey and other carnivores. Packrat middens in the caves preserve a record of plants that grew in the area. Ongoing research on the materials from these caves is helping to paint a picture of ecosystem change in the context of changing climate and, because they were near Lake Bonneville, changing lake levels. Scientists are also studying how living animals are responding to the challenges presented by a changing climate. 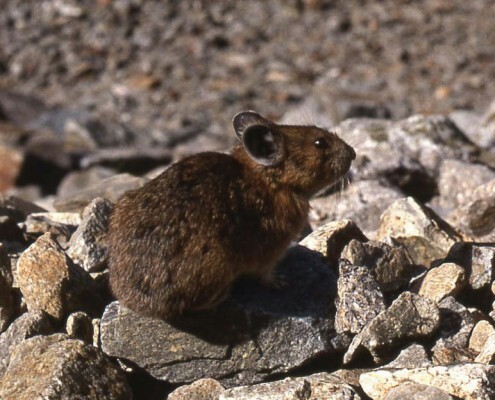 One animal that is being studied in this regard is the pika. This small relative of the rabbit inhabits mountain talus slopes in much of the Rocky Mountains and some mountain ranges of the Great Basin. We know from the Pleistocene fossil record that pikas once inhabited valleys and lowlands in the Great Basin. Because pikas cannot withstand the high temperatures or eat the vegetation associated with today’s valleys and lowands, their populations are restricted to isolated mountain ranges. 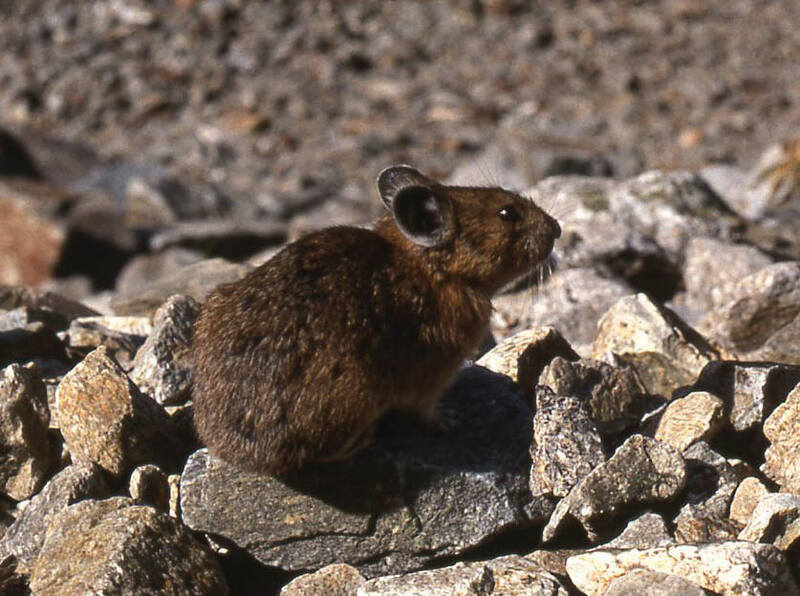 A number of pika populations have become locally extinct from mountain ranges in the Great Basin over the past several decades as a result of climate change and human impacts. We know from the study of the past that our climate is highly variable and subject to dramatic shifts. We also know that these changes can take place relatively quickly, sometimes at a pace that is faster than the capacity of plants and animals to adapt. 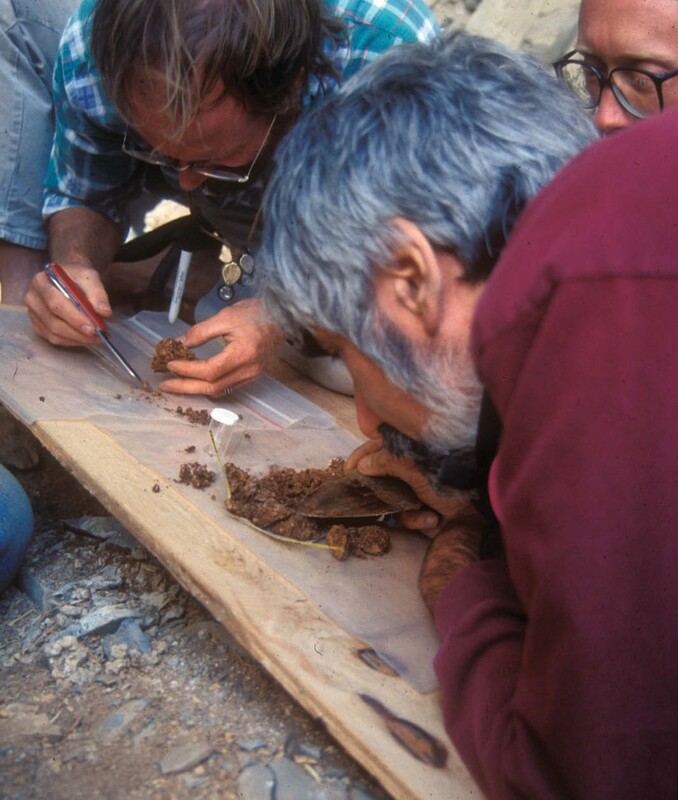 The study of Utah’s Pleistocene geology and paleontology gives us information critical to assessing past environmental changes and can be used to evaluate the effects of future changes.